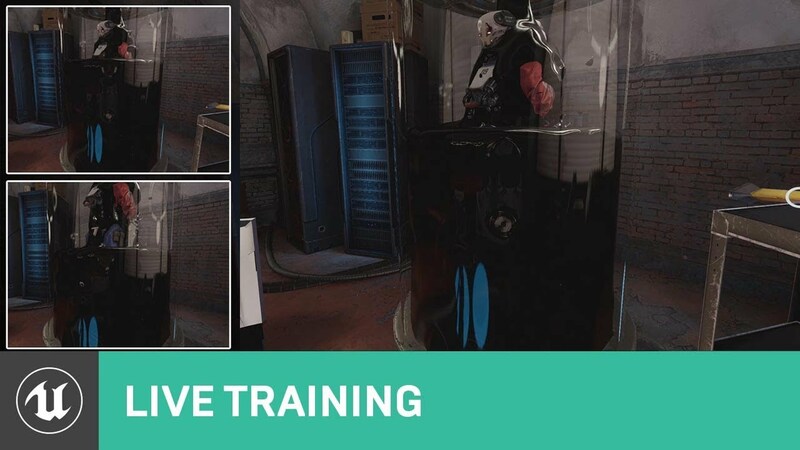 In this week's live training stream Epic Games Senior Technical Writer Sam Deiter will show you how to bring complex pre-rendered simulations into Unreal Engine 4 using the Alembic data format. Whether you are importing a cloth simulation from 3ds Max or a fluid simulation from Blender, Sam will go over the ins and outs of using Alembic data inside UE4 to power some jaw-dropping special effects that all play in real time. Have any questions about the Alembic data format? Comment below! Last edited by Amanda.Bott; 10-04-2017, 06:26 PM. I'm wondering how to import an Alembic File without altering the original one. When I import a Skeletal type file with a Percentage Based calculation Type with a Percentage Of Total Bases at 100 the new imported alembic file increase more than 2x times. How to import an ABC(Alembic HDF5/Alembic OGAWA) into Unreal without altering the original file ? great subject, totally clueless & Sam again in a stream, wow. Sam twice in a row? will the Universe implode? can we handle this? stay Tuned !!! & Tim Hobson too? omg... we R So Doom'd ! course we get to see the stream first tho' !! Last edited by ayretek; 09-20-2017, 12:48 PM. Haha - I sure hope the Universe can handle all the knowledge he's droppin'! Last edited by Amanda.Bott; 09-20-2017, 08:27 AM. I had heard alembic was used on the facial animation for the Fortnite cinematics. Is this true? If so, I would really like to hear how something like this can be practically implemented. About Fortnite, why only the heads were Alembic? Is it not possible to use the whole body animation for cinematics like that? I ask that because I want to render a short in Unreal with characters animated in Blender. Using Alembic for the whole character animation would be a dream. Interesting questions about using Alembic. More information on work done on Fortnight would be great. I'd like to know what else can you achieve by using alembic that you can't achieve with other file types. Can you please tell me the correct scaling for Alembic from Blender? 1) Is there a way (or plans to..) handle motion blur for alembic-cached geometry? for example, we have imported whole character as alembic-geo-cache. This character is running through the scene. But without motion blur at all . We assume that it because Unreal just can't handle motion blur on animated geometry cached data.. Is it correct? May be you can recommend some tricks to fake it though..
3) How about supporting USD (universal scene description from Pixar) file format? Can we use geometry cache from it? and whats the pro/cons/ and difference of using both..
Last edited by robocop; 09-21-2017, 04:39 AM. Thanks for that tutorial! Was very informative. VFX Guide to the Fortnite Cinematic Trailer. Hi Adriano. There are a couple of reasons why the heads were separated from the body. Unreal's implementation of FBX into the engine will only support 8 influences per vertex. While this is sufficient for most game scenarios, it was too limiting when trying to achieve really nice facial performances on a character. The separated head deployed a 201 joint facial rig with blendshapes and lattices to give animators to full advantage of Maya's deformation capabilities. The deforming mesh, when exported as an alembic file was brought into UE4 as a skeletal mesh and streamed during playback in realtime. The character bodies, however, were FBX files who's game skeletons were enhanced by ART v2.0 tools by adding additional leaf nodes that could be driven in engine by anim physics. The 8 influence limitation wasn't a huge deal for the bodies. Could the characters be entirely alembic cached? Sure. But then you'd loose all that secondary animation goodness that anim physics provides. I'll be giving a talk at Montreal Dev Days next Thursday (9/28) to discuss the Fortnite Pipeline. It will be recorded and made available after the event. This is interesting - is there a way to set a geometry cache to a specific frame? I want to be able to drive the frame position with a timeline. Does Alembic work on android/ios ? i know its heavy but does it work ?